This photo is donated by The Bonsall History website. Many of the girls are named and have been traced in the 1901 Census. The age in the Census is given next to the girl's name. 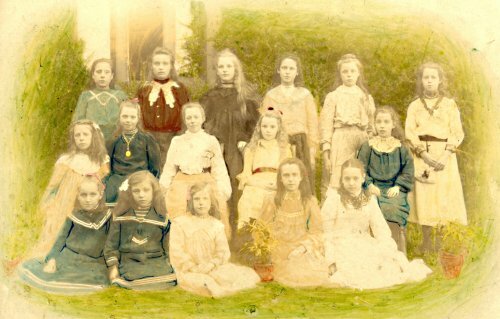 An estimate of girl's ages in the photo suggests it was taken in 1909. All the girls are from Bonsall. The school is possibly the "School House" run by Alfred Moody in Arthur Lane, Bonsall.